The massive rubbish dump known as Koshe or Repi or Reppi in the outskirts of Addis Ababa slid down on 11 March 2017 provoking the death of at least 113 waste-pickers and a dozen of injured. 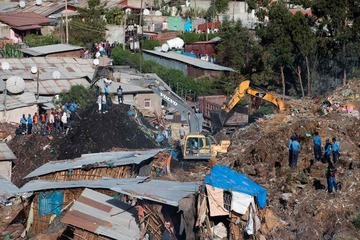 The massive rubbish dump known as Koshe (that it means dirt in Aramaic) or Repi or Reppi in the outskirts of Addis Ababa slid down on 11 March 2017 provoking the death of at least 113 people and a dozen of injured. The landslide also levelled more than 30 makeshift homes built of mud and sticks where perhaps more than 300 people of squatters were living. The landfill has been a dumping ground rubbish for more than 50 years and it is currently the biggest of the country. City officials say close to 300,000 tonnes of waste are collected each year from the estimated four million resident’s capital. About 500 qorales—the local term for small-scale unregistered waste collectors – are believed to work at the landfill every day, scavenging for food and items they can sell such as recyclable metal sorting through the debris (6) (2) (1) (9). The informal plastics recovery system is particularly efficient, in that an estimated high volume of plastic materials (23 tons) is informally collected and recycled. However, the municipality has never developed any systematic efforts to integrate the informal waste collectors into the formal waste management system and their significant contribution to waste reduction, reuse and recycling was either unrecognized or ignored. On the contrary, conflicts and hostilities between formal and informal operators are still serious (9). Waste-pickers and communities settled around the landfill are exposed to great health risks due to the high levels of environmental contamination, including ground and surface water contamination. A project to capture and flare methane fumes, to limit greenhouse gas emissions, has been operational since 2013. However, the Repi landfill site does not meet the necessary criteria yet, not least in terms of minimum buffer distances required for safe waste disposal, between the site and other land use activities, such as settlements, schools, hospitals and recreation. (11) Smaller landslides have occurred at the Koshe landfill in the past two years, leading to the loss of lives and injuries, albeit at a smaller scale. Local residents blamed for that landslides a biogas plant being constructed since 2013 on the top of the rubbish. The project aim to turn waste into a source of clean energy generating 50 megawatts of electricity upon completion (initially expected for the last year) (2) (6) (3). The Communications Minister Negeri Lencho said the cause of the landslide was still being investigated and denied that the plant’s construction had anything to do with the collapse. He blamed the squatters for digging into the hillside, destabilizing it and causing it to fall. And he added that all the shacks built on the landfill would be demolished and the residents resettled elsewhere. According Amnesty International the government was fully responsible for the disaster, because it was aware that the landfill was full to capacity but continued to use it regardless. It also let hundreds of people continue to live in close proximity to it (6). More recently the government has planned to shut down the site and open a new landfill outside the capital in 2016. But that was in a town called Sendafa in the Oromia region, home to the country’s largest ethnic group, the Oromo, who have long complained of marginalization at the hands of the government. Oromo grievances erupted into widespread protests starting in late 2015, and security agents often responded with deadly force. After Oromo farmers blocked garbage trucks from dumping at the Sendafa site in July, Repi had to resume its role as Addis Ababa’s main dumping ground (11).